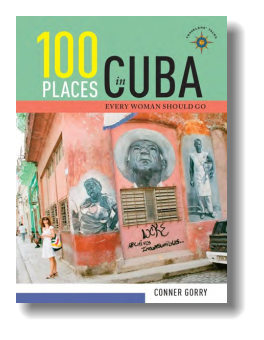 The 100 places profiled in this book are the result of decades of travel, research, and living in Cuba by a US journalist with uncommon access, ensuring travelers incomparable experiences. Much more than a prescriptive list, these narratives incorporate adventures and mishaps, insider opinion, slang, gossip, and conversations with Cubans during a historic shift that saw Soviet support evaporate, Fidel Castro takes his final bow, economic reforms whiffing suspiciously of capitalism, and quasi-normalization with the United States. Conner Gorry is a New York writer and journalist who has called Havana home since 2002, where she works as senior editor for MEDICC Review, the only peer-reviewed journal in English dedicated to Cuban health and medicine. In addition to contributing to many newspapers, magazines, and anthologies, The Best Women’s Travel Writing and The Best Travel Writing among them, her recent books include Cuban Harlistas: Mi Amor and Havana Street Style. Her blog Here is Havana has been called the “best writing that’s available about day-to-day Cuba.” In 2018, she published TWATC, a collection of poetry and prose, available at Cuba Libro, the English-language bookstore and café she founded in 2013. To celebrate the publishing of this book, she got a tattoo of Cuban Independence hero and native New Yorker, Henry Reeve. Conner Gorry has been interviewed by The Associated Press, The BBC, Travel Channel, PRI “The World,” Travel Show, Uncommon Grounds, Das Erste (Germany), The Today Show. Founded in 1993, Travelers’ Tales publishes the best travel writing from world-famous authors and emerging writers, with the goal to inspire and enlighten readers through true stories by travelers who have explored the depths of their experiences. The award-winning series includes country and regional guides; books that explore the themes of women's travel, spirituality, food, humor, and adventure; travel advice books; single-author travel narratives; and Travelers’ Tales Classics, a series that introduces out-of-print favorites of travel literature to a new audience.